Civilization in Egypt holds many facts which are hidden within themselves and are never revealed. The great land along the banks of Nile has been extraordinarily mentioned in the modern as well as the ancient history. Around 3100BC, after the political unification of Upper and Lower Egypt, Pharaoh was the supreme for the rituals which were carried out. Egyptian deities were worshipped by the people and were considered as the form of nature that they should not make angry. So what were these natural forms which the population of ancient Egypt used to worship and offer their prayers. Lets’ view at the surface to the top 10 worshipped ancient gods of Egyptian Civilization. As Zeus in Greek, Amun-Ra or Amon in Egypt is considered as Kings of Gods and Goddesses. Believed as the Father of the Pharaohs, Amun’s female version is Amunet and is considered as the “The Female Hidden One”. Forming the “Theban Triad”, Amun and Mut along with their offspring Khonsu “Moon God” were worshipped throughout the ancient Egypt. Amun was not only worshipped in Egypt, but also outside Egypt as Amun-Ra after the amalgamation with the Sun God Ra of Ancient Egypt. Mut meaning Mother in Egyptian language, is a primal deity in Egyptian who wears two crowns on her head each representing Upper and Lower Egypt. 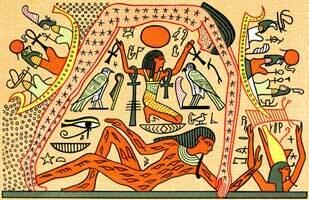 Also titled as “She who gives birth, but was herself not born of any”, Mut is represented as Vulture in hieroglyphs. 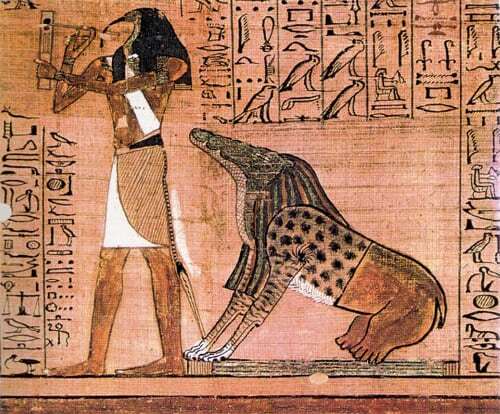 With different integration with various other deities Mut is portrayed as a Cat, Cobra, Cow and even Lioness. 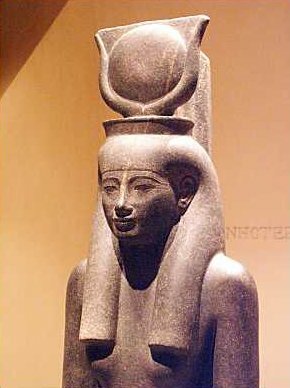 Mother of Khonsu, Mut with her different associations with many arbitraries was supported by many rulers of Egypt who followed the civilization. Considered as an oldest child of Earth God ZEB and Sky Goddess NUT, Osiris is worshipped as God of the afterlife as Egyptian believe there is life after death. Painted with green skin in the portrayals, Osiris was a god of vegetation which indicated Renewal and Growth and took in charge for the fertile flooding and the vegetation around the Nile banks. Osiris married his own sister Isis and was murdered by his own brother Seth. Despite being murdered by his own brother, Osiris was brought back to life by the magic of Isis for conceiving a child. Horus is the offspring of the Osiris and Isis, who avenged his father’s death and arose as new king of Egypt while Osiris became the God of the Underworld and assisted for the afterlife of the Pharaohs and even the population. Before Osiris took over, Anubis patrolled the Afterlife. Being a psychopomps Anubis was the offspring of Ra and Nephthys was known for mummifying the dead ones and guiding the dead soul towards the afterlife. Having his skin tone black, he is symbolized as the dark Nile deposits which eased off farming and making it a successful one. With the head of a jackal and a body of the man Anubis was also symbolized Renaissance and the staining of the dead bodies after the embalming (Preserving the dead human remains). 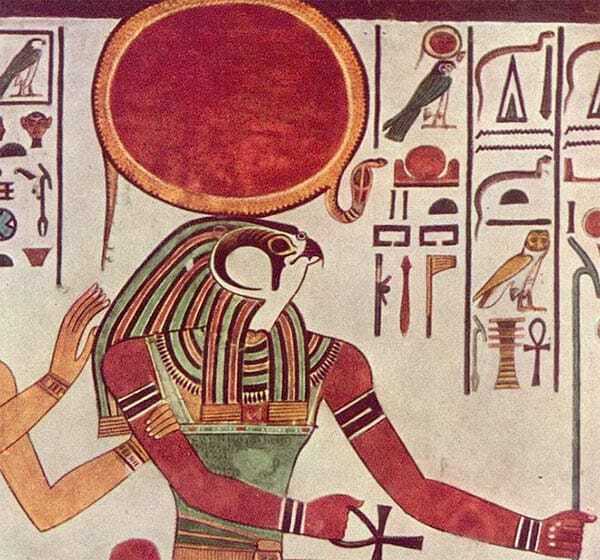 A midday sun as identified Ra or Re holds important position in the Egyptian history. The God of Sun who has a sun disk around his head is believed to have created this world. Every sunrise and sunset was symbolized as renewal process. 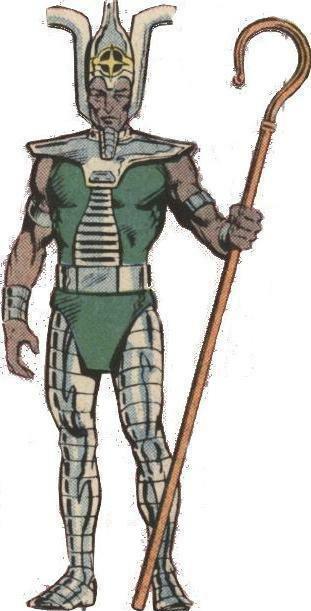 Portrayed as a falcon headed man, he and Horus shared an association which led him known as the Horus of the Horizon. Many ancient Egyptian gods were merged with Ra and many were created by him as well with some rival gods like Ptah, Isis and Apep. Horus has a special position in the Ancient Egypt. Considered as the offspring of the Osiris and Isis, he avenged his father’s death and ruled Egypt. As per other myth he is considered as the brood of the Zeb and Nut, however this falcon headed man with the crown of red and white was worshipped as the God of Sky, War, Protection, Light. The eye of Horus or the Wedjat Eye was personified as the goddess Wadjet and was popularly known as “The Eye of the Ra”. It symbolized that everything is being watched upon from above. An arbitrator who settled the disputes between good and evil, Thoth is considered as the god self created. Master of both physical and divine laws, he along with his counterpart Ma’at maintained the universe by the mastery in calculations. Egyptians acknowledge him as an author of science, philosophy and magic. An ibis or baboon headed man was considered to be the most learned god in the ancient history. Earlier considered as moon god for keeping the time count even when the sun is not there, Thoth is recognized as the one who created a 365 day calendar. Rendered as “Mistress of the West”, Hathor was worshipped as she welcomed the dead into the next life. An offspring of Ra, she exemplified motherhood and feminine love. Egyptians offered prayer to her as Goddess of Music, Dance. She is believed to provide a blessing as a helper of women during pregnancy and childbirth. Affectionate, Humble and Kind to all dead and living she was also known as Lady of Heaven, Earth and Underworld. Leading and Protecting the Pharaohs in the war who is the daughter of Ra, Sekhmet is depicted as a lioness in ancient Egypt known for her fierce characters. Also known as “The Powerful One” she demolished the enemies of her allies. Her appearance had a solar disk with Uraeus which was coupled with royalty and divine. Sekhmet assisted goddess Ma’at in the Judgement Hall of Orisis which also made her known as an arbitrator. 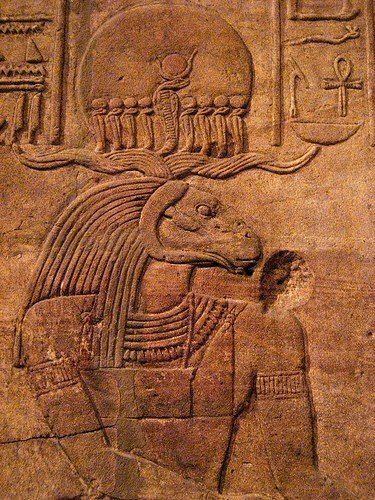 Also described as the Father of Snakes Geb was a provider of a crop and healing. With goose on his head this bearded man was believed to have caused earthquakes whenever he laughed. Known as the offspring Shu (the god of air) and Tefnut (the goddess of moisture), Geb has an important role in the Book of the Dead as who weighs the heart of the dead in the Judgment Hall of Orisis. Egyptians believe that he will keep hold of the soul of the wicked. In ancient Egypt, god and goddess were the mere depiction of all the fundamental necessities required for sustaining life. The cults were developed and many associations can be seen because of the interconnection between the essentials for the living. Pretty much hopeful, everything that made life possible was considered as god and goddess in Ancient Egypt. I thought Amun Ra and Ra were the same people? What about Ra’s three forms the Kheprea the beetle in the morning, Ra in the afternoon, and Atum the moose god in the evening? What about neith she she gave birth to the earth and a lot of gods/goddesses. She also is the goddess of war. I think that all these facts sre true indeed and it was a great help indeed. You see it has helped in my Ancient Egypt project inmy school .As I am a 9 year old the teachers have given us a 20 page task to be completed in 8 week and it’s not as easy as you think . So this website has been of great help and I am so very pleased. Just a thought but you could have added the sky goddess Nut and take away Hathor the goddess of mother hood . But other than that great website ! I recommend this a lot ! I learned that by comparing this list, all gods and goddesses of Egypt were conquered by the 10 plagues from the God of Moses and Aaron and the Israelites. Amen to the end of rule of Amun-Ra, ancient and always. The multiplicity counterpart roles and relationships the deities of ancient Egypt transverse is very intricate. The Egyptians perceived life and the divine intricacies behind it in a outstandingl intricate and multi layered existence. The God’s all had various yet simultaneous relationships to each other and purposes served by them. Being so ancient a belief system evolving over many many centuries that is today lost in concept and practice we can only connect educated dots so to speak where much is concerned. I thought that Horus was the god of the pharaoh. Also, where is Isis? Ra/Amun-ra depending on the period we’re talking about was the first pharaoh of the Gods, as he aged he heard a prophecy that a child of the sky goddess Nut and the earth god Geb would succeed him. Unwilling to relinquish the position he ordered the god of the wind Shu, Nuts father to separate the lovers Nut and Geb however Nut was already pregnant. Thus Ra forbade her birth her children on any day of the year to protect his position. To combat this Nut gambled with the moon god Khonsu to procure enough moonlight to create the last five days of our current year (according to myth there was once only 360 days to the year). She birthed each of her five children on one of these days her children were Osiris, Set, Isis, Nepthys, and Horus. 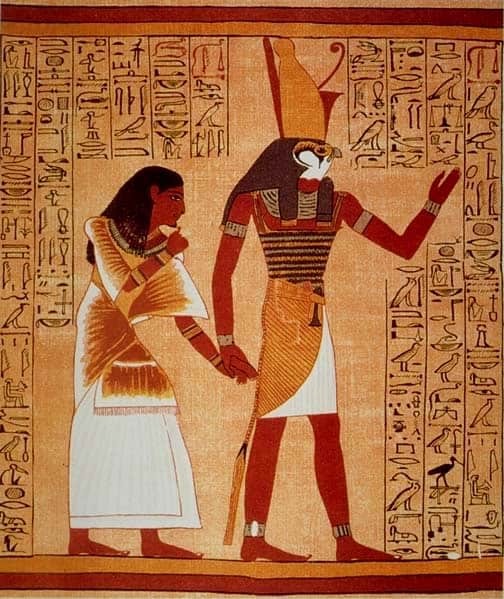 Isis married her brother Osiris and Set his sister Nepthys, these relationships will be important later on. Isis poisons Ra with the venom of a snake mixed with Ra’s own saliva to form a ‘super toxin’ that causes Ra to become extremely ill, Isis feigns concern and as the goddess of magic ‘stumbles’ upon a cure to Ra’s affliction. To be cured Ra gives Isis his true name, which in turn gives Isis control over his very being. Isis cures Ra but forces him into retirement with her new power over him, placing Osiris on the throne to become the new pharaoh fulfilling the prophecy that first caused Ra concern. Osiris’s dynasty was prosperous, many gods appreciating a new younger pharaoh however Osiris’s brother Set was discontent. He plotted to overthrow his brother by laying an intricate plot, he brought an enchanted sarcophagus to present to Osiris as a gift saying it would mould itself only to fit the true pharaoh. Many gods tried to fit in out of sport to test the claim and none fit properly into it, when Osiris tried it he fit just as Set had proclaimed however Set’s lackeys and allies secured the lid to the sarcophagus before Osiris could exit and sent him off to an unknown corner of Egypt. Set then claimed the throne as it’s next heir, becoming a tyrannical pharaoh. Here I’m going to skip a lot of details, we’re discussing the pharaoh of the gods not how they were raised. Horus avenges his father/brother by killing his uncle/brother and then assumes the position of pharaoh himself supported by his mother/sister Isis. Osiris in turn becomes the pharaoh of the deceased ruling the afterlife just as Horus rules the realm of the living. I’m a fan of Wadjet, that’s a goddess associated with the Cobra, protector of Egypt and even protector of Ra at times, linked to the Eye of Ra, as she nested on his crown, and in that role went from spiting venom into the eyes of her enemies to spiting fire instead. She had become so revered at times she was considered one and the same as MUT, second on the list. I am not exactly sure if it was referring to her or Apep but I seen a quote say “To be respected but never trusted” given Wadjet is considered extremely good I guess I mistook it for a comment about Apep, who is a major snake or serpent antagonist of Ra. Either way, I think she is cool. What about Isis? Goddess of motherhood and love. I would like to point out that Hathor and Sekhmet are one and the same, just different aspects of the same being. The myth goes that the people complained to Ra that Sekhmet who loved violence and whose main task was to crush Ra’s enemies and would often ‘drink the blood of Ra’s enemies’, was instead slaughtering both those of good and evil (worship/do not worship Ra) alignment in Egypt. They pled for Ra to restrain her however he did not have the strength to restrain her directly whilst still maintaining his duties. Still he couldn’t let the people that worshipped him to continue to suffer, thus he had them present Sekhmet with barrels of wine dyed or naturally red and had the people tell Sekhmet that it was the blood of Ra’s enemies. Delighted by the chance to guzzle more of Ra’s enemies blood Sekhmet drank/skulled the wine and grew so drunk she fell asleep. As she slept Ra transformed her into a goddess with attributes the exact opposite of her previous self, her love of war changed to love of life, her destructive tendencies changed to protective ones, etc. 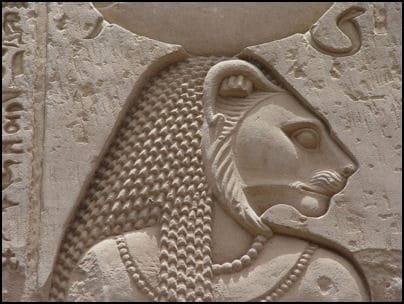 Ra maintained the ability to awaken Sekhmet in times of war, however she remained as Hathor the majority of the time due to her uncontrollable nature as Sekhmet. Now I’ll admit that I’ve greatly summarised this myth, however that doesn’t change my justification for my point above. 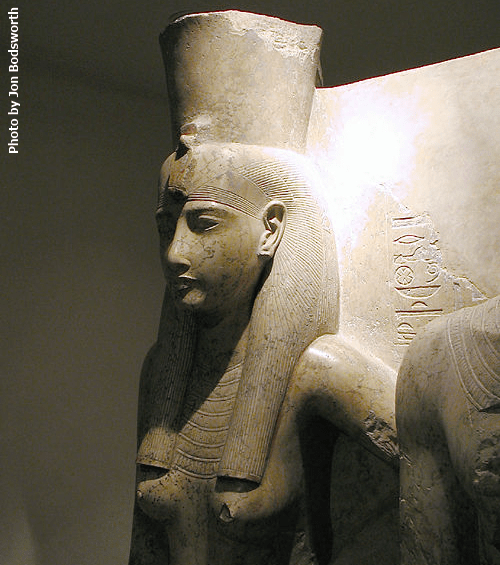 Hathor and Sekhmet are two aspects of the same deity, just as Kephri is an aspect of Ra. Although Ra was the main aspect worshipped and both Sekhmet and Hathor were worshipped to a great extent, they should still at least have given a nod to this fact of the goddesses duality even if they placed her two personalities into separate slots. Is Horus the grandson of Ra yes or no ? And is Anubis and Horus brothers yes or no ? Many similarity with Indian God’s and goddess.. God mother Mat.. In India.. Depending on language.. Calling different names of mother God.. Like Matha, Amma, Amman, etc.. And mother God is assisting Lion also..
Other God.. Sun, Moon, air, fire, sky water, etc.. Also similar.. Only the Name and smaller changes are there because of language geographical change..
Indian calling “Sanadana dharma” (external duty) is following around worldwide based on geographical atmosphere.. Nature and elements are considered God’s.. Etc.. Energy sources in the universe are treated as God’s..
Rights way of living with many engineering, medical and architectural worlds.. I feel like a few of these gods are similar to the bible stories. Is this true?